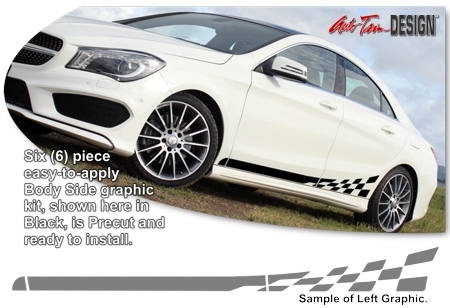 Dress up your '13-Current Mercedes-Benz CLA-Class with this simple yet sporty six (6) piece Body Side Graphic kit. Available in a wide variety of colors, easy-to-install graphic is designed to fit specifically on all '13-Current Mercedes-Benz CLA-Class lower Fender and Door areas as shown in the image. Please see Product Parts List for further application details.